The Objective: To cause people to willingly take the actions you want them to take. The Challenge: To gain and hold the attention by introducing a thought more interesting than the thought that had previously occupied the listener’s mind. The Vehicle: Intrusive, invasive sound. Why is it that when you're driving and looking for an address, you turn down the volume on the radio? And why is it when you are watching TV and the phone rings you again turn down the volume. Ever stopped to think about it? You can close your eyes, but you cannot close your ears. Sound is invasive, intrusive, and irresistible. You hear and retain information even when you're not listening. You hear even when you're fast asleep. How else would you know there's a burglar in the house? One of the greatest myths in the world today is that "we remember more of what we see than what we hear." In fact, quite the opposite is true. That great scientist of the eye, Josef Albers, says it quite plainly in chapter one of his landmark book, Interaction of Color, "the visual memory is very poor in comparison with our auditory memory." The primary gift of humanity is our ability to attach meanings to sounds. This is accomplished in 3 highly specialized parts of your brain - Broca's area, Wernicke's area and the Auditory Association area. In fact, your physical ability to coordinate the movements of your diaphragm, larynx, tongue, and lips so that you can produce human speech is also owed to Broca's Area, a specialized extension of Auditory Association into the Motor Association cortex. Did you know that the written word has no meaning until the brain has translated it into the spoken word? Ever been lying in bed reading a book and suddenly realize that you've been scanning the same paragraph over and over for a very long time and you have no idea what it says? Yes, your eyes were sending the written symbols to your brain, but those symbols were no longer being translated into the sounds they represent. A subtle undercurrent of ongoing delight is what causes listeners to keep listening to Radio and TV ads. Delight makes Radio & TV ads magic. Predictability kills them deader than a bag of hammers. How predictable are your ads? A great writer is one for whom writing is more difficult than it is for other people. Great writers won’t allow themselves to write what comes easily, because they know that what comes easily to them will also be painfully predictable to the listener. Clichés are easy to write because they just pop into your mind. The reason they “sound right” is because they’re predictable. There can be no delight without surprise. Surprise is the foundation of everything delightful. The amount of surprise can be as subtle as an unusual combination of words that create an intriguing mental image, or as dramatic as a great punch line. Either way, your objective is to delight the mind with the power of the unpredictable. But is everything that is surprising delightful? Of course not! Negative surprises create confused, irritated listeners who will simply spin the dial to another station that will surprise them in happier ways. When attempting to gain access to a listener’s visuospatial sketchpad (imagination), whether in a face-to-face sales presentation or when writing a piece of Radio/TV copy, pay close attention to your action words, your verbs. Listeners can take no action they have not first imagined. To cause them to imagine an action, you must use a verb. But NEVER the one they were expecting. 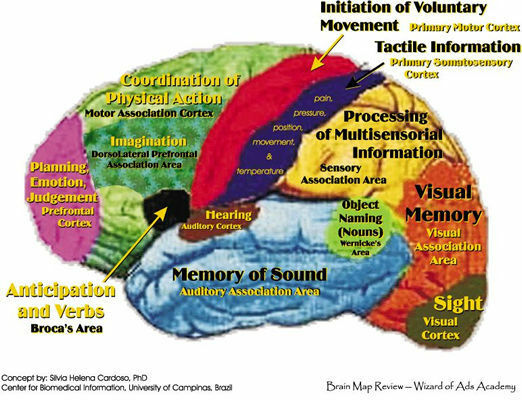 Verbs, much more effectively than nouns or adjectives, will move your message past Broca’s Area, that part of the brain that rejects the mundane and ignores the predictable but allows the delightfully surprising to have immediate access to the visuospatial sketchpad of the listener’s imagination. And it is on this visuospatial sketchpad that the listeners of your ads will see themselves DOING the thing you want them to do. Whether it’s a face-to-face sales presentation or piece of Radio / TV copy, the process is the precisely same. True persuasive power is always hiding in the verbs. Harness them and ride them to the top of Radio / TV Mountain. A bad ad is about the advertiser. A good ad is about the customer. Eliminate the black words. Avoid words that do not contribute toward a more vivid or colourful mental image. Be Monet. In order to create great ads, follow these three rules: Ignore the details, exaggerate the colour, and remove the black. In the same way Monet painted, write "impressionistically," rather than accurately. Use poetic exaggeration and overstatement. Select words according to the intensity of their associations, or colour. Minimize the use of black words. Your ads must also have a FMI, the first mental image or opening scene, and a LMI, the last mental image or closing scene in a mental sequence. Great writers involve the listener as an active participant.